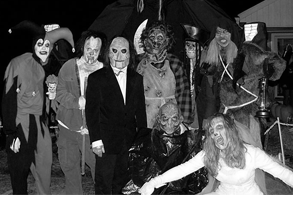 This fall, the 2019 season, we are celebrating our 10th season at The Haunt at Rocky Ledge, but our history of scares goes back to the mid 1980's! Marc, Mat, Mike, and Rich now with children of their own, try to keep the spirit of Halloween alive! 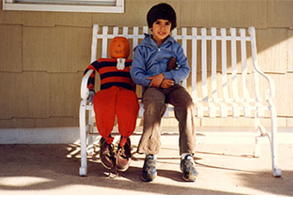 In 1985, Marc Mancini at the age of 10, decided one Halloween night to build a scarecrow sitting on a bench. As trick-or-treaters approached the family home on Gainsborg Avenue in West Harrison, Marc would stealthily control the scarecrow with a string through a nearby window, frightening all who drew near. This event was the spark that started a lifelong fascination with Halloween. Shortly after, Marc along with Mat and Rich, attended the Haunted House at Preston Elementary School's Annual Halloween Fair in West Harrison. 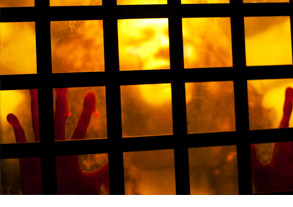 For them, this was the first experience in a walk-through haunted house attraction. They loved all aspects of the haunted house; the sounds, the actors, the skits, the sights, even the smells! They couldn’t get enough! Fast forward to their high school years. 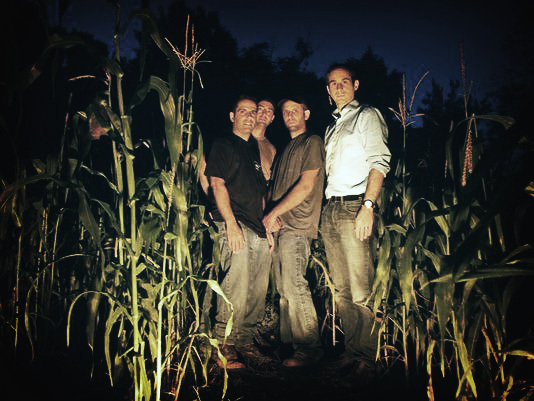 Marc, Mat, Mike, and Rich took over the production of the haunted house attraction at the Preston Elementary School and became in charge of the same fair they loves as kids! The trio produced, built and acted in the Preston’s haunted house for 4 successful years. During these early years, they learned about scheduling, timing, hiring, and acting. They had a great time taking on this huge responsibility at such a young age. Unfortunately, Preston Elementary ended the Halloween Fair in the 90's. At that time, the boys thought their Halloween production career was over. Little did they know, it just got started. Mid 2000's: Haunted Dead End! The three loved Halloween and were committed to continuing to spread Halloween spirit each and every year. The search for a new haunted nightmare ensued and was finally created back at the home where the scarecrow incident had taken place years before! Yes, the production shifted right back to Gainsborg Avenue in West Harrison in October of 1994 as the second phase of Halloween scares! 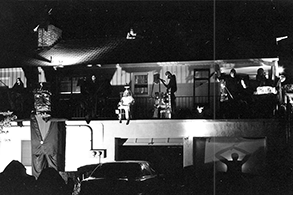 This event involved a fully decorated property completely decked out with hand made props accompanied by costumed actors interacting with trick-or-treaters. Now the Mancini family all joined in on the action with Marc and Mike’s brother Jon, sister Melissa, mother Liz and father Tony partaking in the planning and creation. They spent their own money for building supplies, costumes, and more. As long as the community was enjoying it, they were happy to provide the entertainment and a provide a safe place on Halloween night. The production was growing and slowly without them realizing what was happening, they were creating something special - a tradition for the residents in West Harrison. 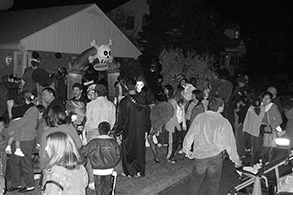 Each year they would plan, build and act in this annual Halloween night event on this section of Gainsborg Ave. It was a dead end street and perfect for this type of event where people would gather with families hanging out all night for this free experience! For many each year, this was where they spent their Halloween night. It was appropriately named "Haunted Dead End." News of the event began to spread to all parts of West Harrison and beyond and 6 years later, there was a huge following including residents and folks from Greenwich, CT, White Plains, Long Island and more! With absolutely no advertising, the event started getting news coverage from the local press. In 2001, they made their debut on News 12 with video piece. In 2004, articles were written about it in both The Journal News and The Harrison Report. News 12 came back in 2006 and did a live broadcast! 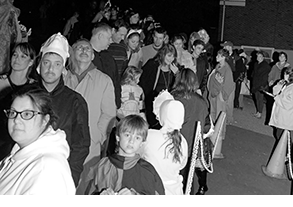 By 2003, the crowds were so large that the Harrison police department needed to be at the event to manage the crowds, block the road, and direct traffic. In addition, more actors were needed to entertain the visitors they expanded recruiting people to help out. It took 25 people run the event on this little dead end block. In 2007, a hand made walk-through with a 30-foot vortex tunnel was created to add to the experience. In 2008, the two-car garage also was added as part of the walk-through with lines of people waiting to enter! There had always been a pipe-dream of turning their love of Halloween into a real business. For years, it was discussed but never really considered. In the winter of 2008 the group began to talk to the owners of The Rocky Ledge Swimming Association and 2009 was the final production of Haunted Dead End on Gainsborg Avenue. For 15 years, the team had entertained thousands of people with their love of the holiday. Now the dream of turning their hobby into a business was becoming a reality! 2010: We have waited 20+ years for this moment! 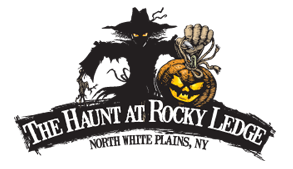 Friday, October 15th, 2010 was opening night for The Haunt at Rocky Ledge and it was a huge hit! With over 5 acres available to create the wildest and scariest experience ever, the team couldn't be happier! With two haunted houses, a haunted trail, haunted woods, corn maze and so much more, it has been a dream come true for these guys! When the team moved to the big stage in 2010, they didn’t know what to expect. All they knew is that they needed to work hard to build up a new fan base. To accomplish this they needed to promote, plan, build, and hire excellent actors! One aspect that sets them apart from other attractions - their actors. 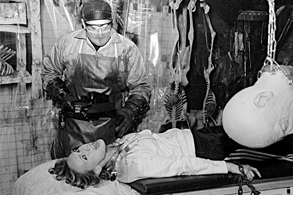 Instead of animatronics, the haunt relys on the human nature of timing a scare that no animatronics could replicate. The talented actors on The Haunt at Rocky Ledge team are second to none! Many of the actors are acting undergraduates. Speaking of the team, they have the most dedicated employees around! The team includes people that helped us out back in the 1990’s. With a strong and committed team, their goal is to produce an experience that each and every individual who visits the haunt leaves satisfied! If you visited us at The Haunt at Rocky Ledge, we hope you enjoyed yourself and hope to see you back. For those who haven’t yet visited us, we welcome you, but be prepared for loads of frightening fun! You’ll run scared! Even though we have grown into a business, things are still done the same way as we did them 20+ years ago. Each of us still build, plan, act, and most importantly we always try to top the previous year! We hope to see you this October!